A cataract is a clouding of the eye’s lens. Cataracts result in blurred and distorted vision and are most often found in people over 55, but younger people can also develop cataracts. Cataracts are believed to be caused by clumping together of proteins that are normally arranged in a precise way to allow light to pass through the eye’s lens and onto the retina. In time, these clumps of protein can grow large enough to visibly cloud the lens. At first, cloudiness may only affect a small part of the lens and a person may not notice vision problems. 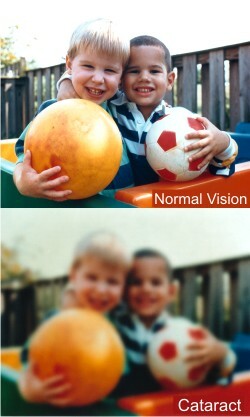 As cataracts grow larger they cloud more of the lens and distort color and focus. Exposure to ultraviolet radiation in sunlight, cigarette smoking or the use of certain medications may be factors for the development of cataracts. Many studies now suggest that including antioxidants in your diet may lower your risk for developing cataracts. Your Downey optometrists can diagnose a cataract in a thorough eye examination and can monitor its development and prescribe changes in eyeglasses or contact lenses to maintain good vision. If you have cataracts that affect your daily activities, we can co-manage cataract care with an expert cataract surgeon who may recommend surgery. Cataract surgery involves placing the eye’s natural with a plastic artificial lens. After surgery, you can return to your Downey Eyecare Center eye doctors for continuing care.